Tymon Mellor: There are three things we can rely upon; prices will rise, politicians will disappoint and there will always be a train on East Rail. The latter was not always the case though, as up until 1974, there were only 17 passenger trains a day, but this was all about to change with the modernisation of the line. During the 1950s and 1960s, passenger growth on East Rail resulted in regular overcrowding at Kowloon, particularly during festival times. Even with the adoption of passing track loops and using all available rolling stock, the trains were often filled to capacity and there was no flexibility in the system for growth. 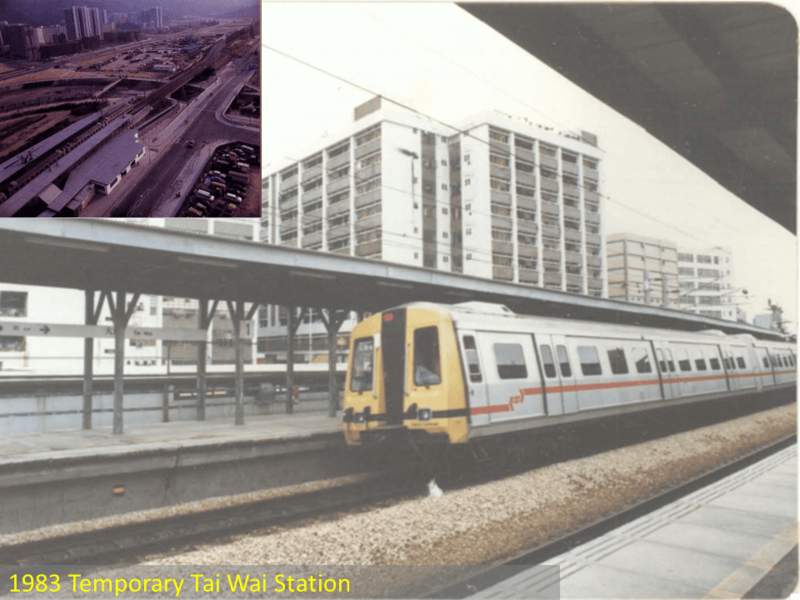 The first priority was to provide a new terminus within Kowloon to accommodate the growing passenger numbers and expanding freight services, followed by the upgrading of the infrastructure and rolling stock to create what we now know as the “East Rail Line”. In 1978, the year that electrification of the railway line was approved, the rolling stock for the East Rail Line consisted of 12 diesel electric locomotives and 96 passenger cars with a total seating capacity of 7,594 passengers. The service operated 22 trains per direction each day, carrying around 35,000 passengers. By the time the new system was commissioned, it was forecast to carry 140,000 passengers a day. The modernisation and electrification project involved double-tracking the line, electrification at 25kV, rebuilding existing stations and adding three new stations, a new fleet of electric multiple units (EMU) trains, new signalling, telecommunications and fare collection systems, new approaches to railway operations, and finally an independent organisation, the KCR Corporation, to operate the line. 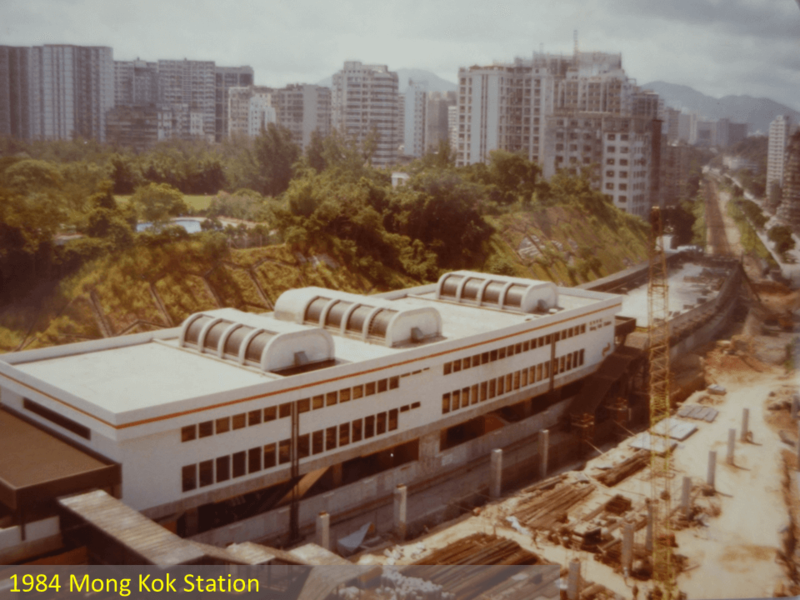 The project started in 1978 and was completed in 1983, with the new Kowloon – Canton Railway Corporation (KCRC) officially taking up the operations of the new railway on the 1st February, 1983. With this new railway, the train service increased to 120 per day, train interval decreased from half hourly to 5 minutes, and journey time decreased from 70 minutes to 32 minutes. Passenger numbers doubled within one year and continued to grow until 2006, after which no information is available leading up and subsequent to the merger with the MTR Corporation Limited in 2008. 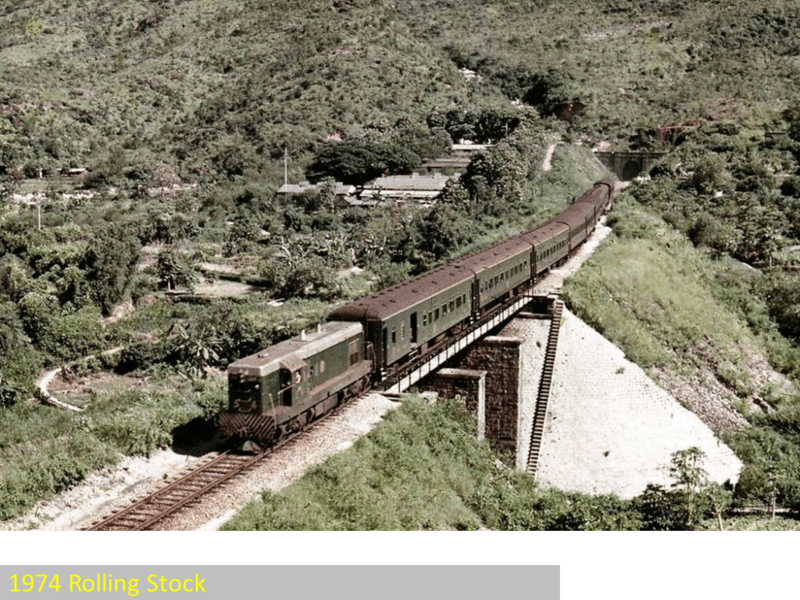 During the 1960s, the KCRC changed over from the use of steam locomotives to diesel hauled trains, operating a half hour service between Kowloon and Lo Wu during peak hours. Patronage growth was greater than the capacity of the single line railway and measures were needed to upgrade and modernise the railway operation. 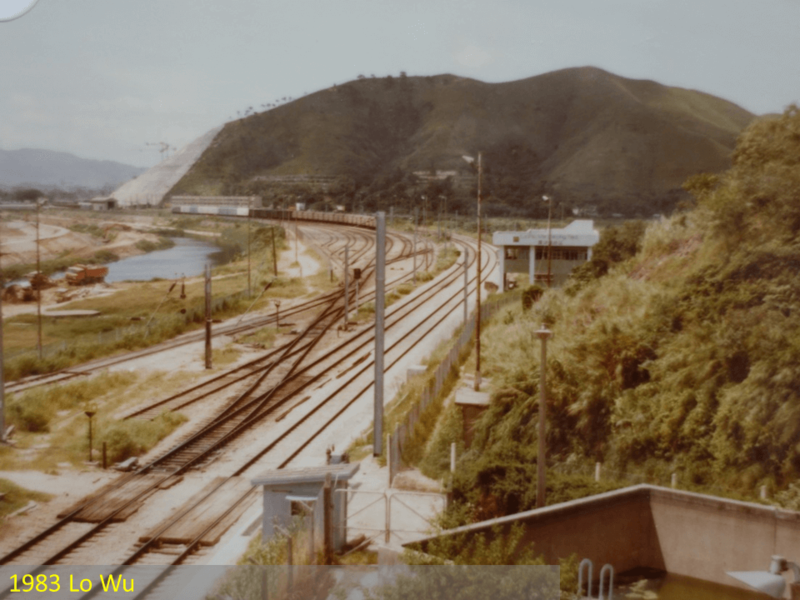 The first stage was the construction of a new maintenance depot, at what is now Fo Tan, with the reclamation for the site commencing in 1965 allowing the Ho Tung Lau depot to open in 1968. 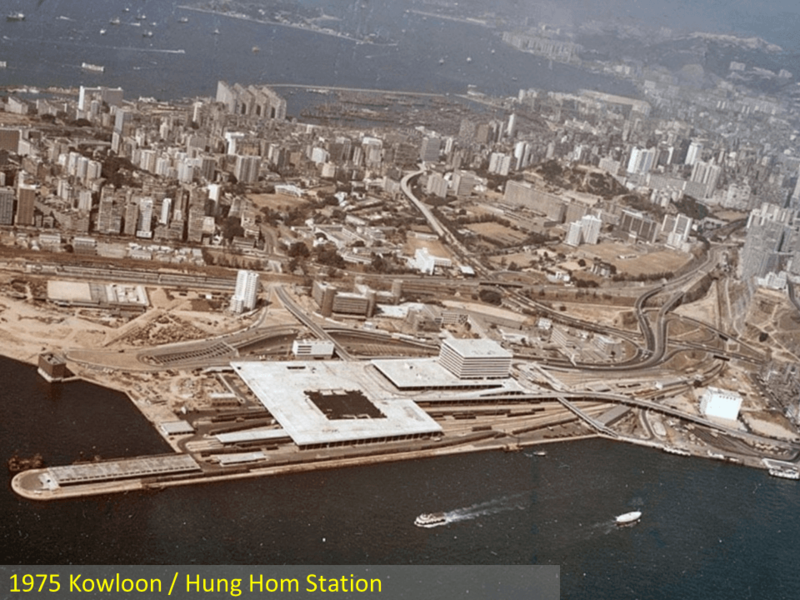 This was then followed by the new Kowloon Station, or Hung Hom Station as it is now called, commencing in 1972, and the new station opened on the 30 November, 1975. The next problem was how to increase the line capacity. Passing track loops had been constructed along the line, but the mechanically operated signalling systems and single line nature of the track limited line capacity. 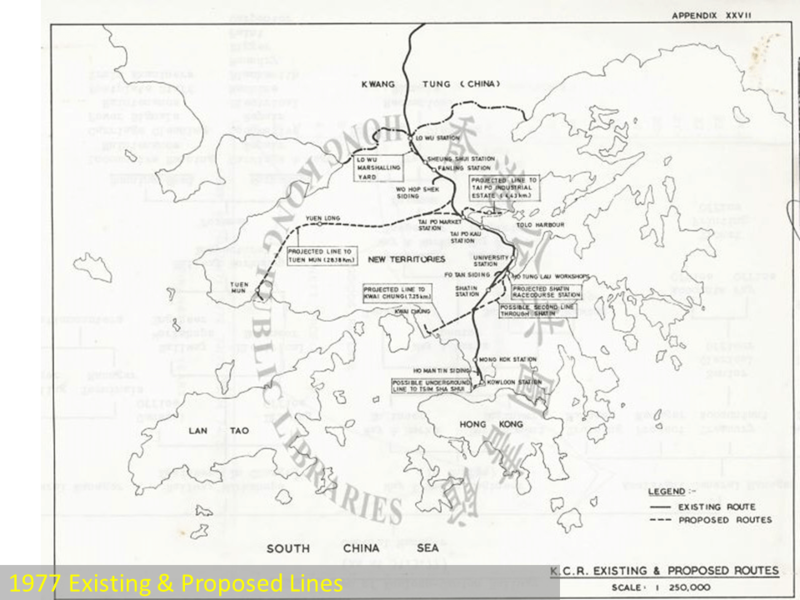 In 1971 with the construction of the new Hung Hom Station about to commence, a proposal to double track the section of railway from Hung Hom to Sha Tin, along with re-modelling of Mong Kok and Sha Tin stations, was under consideration, along with a spur line to the new race course at Sha Tin. By 1972, the plans were confirmed for completion in 1976. This would increase the line capacity of 17 passenger trains and 5 goods trains each day by 3 trains in each direction. To support the new services, 40 new passenger cars were ordered in 1972 and were put into service on the 4th November, 1974. In October 1972, a Steering Group was formed to examine the long term investment in the railway and to contribute to the Comprehensive Transport Study being undertaken by the Government. improvement of Lo Wu Station. They recommended to double track the remainder of the line to Lo Wu, construct a second Beacon Hill tunnel, remodel Mong Kok and Sha Tin stations, provide a loop line to the new Sha Tin Race course, and construct a freight yard at Fo Tan to serve facilities being built by the China Resource Company. These proposals were estimated to cost HK$557.65 million. Following the opening of the new Hung Hom terminus station, with the improved platform arrangements and double tracking, the train service was increased to 20 passenger trains per day in each direction along with 8 goods trains. With the increased train frequency, the journey time was increased by 3 minutes to allow the smaller locomotives to achieve the punctuality requirements! With the revised timetable, over 80% of the trains arrived at their destination within five minutes of the scheduled time. The railway operator was confident that with the employment of train controllers, punctuality could be further improved to 90%. 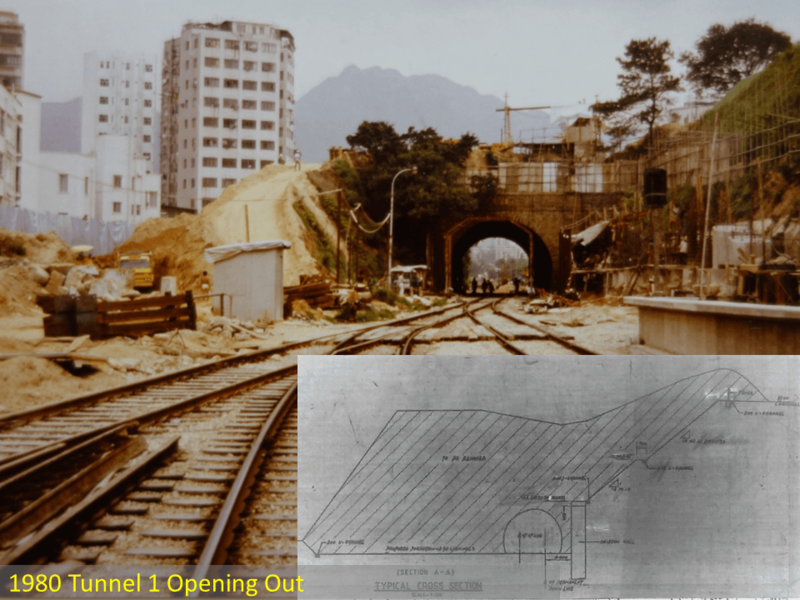 The first phase of the double tracking, between the new Hung Hom station and the expanding town of Sha Tin, excluded a new Beacon Hill tunnel. When the original line was constructed in the early 1900s, the land and formation works were designed for double tracks, but the bridges and tunnels were only constructed for single line operation. Thus, construction of the new track required re-construction of all the bridges along with the new trackwork and signalling systems. 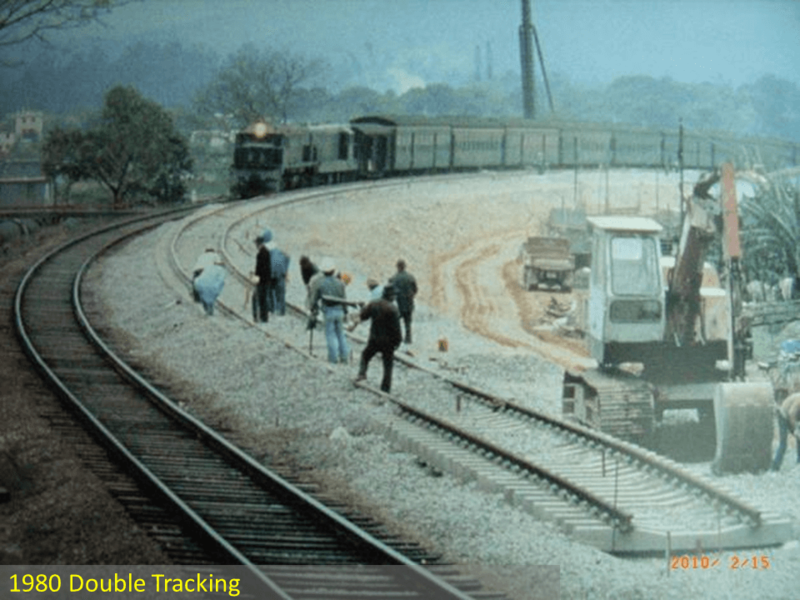 By 1976, completion of the first phase of double tracking was on programme for 1977, but it could not be fully operational until the new colour light signalling system was installed in 1978. Other improvements were also being implemented such as, six power operated ticket printing and issuing machines were purchased. These could issue twice the number of tickets sold manually and would reduce the waiting times for buying tickets. the planned Tai Po to Tuen Mun line was a low priority but consideration be given to an alternative alignment from Sheung Shui or Fanling to Tuen Mun. It was clear that a broader direction was required to define the future of East Rail. In 1976, Transportation Projects Ltd, a subsidiary of GEC based in the UK, and Sofrerail of France, were invited to formulate proposals on modernising the railway and integration with the proposed new metro systems planned for the Colony. 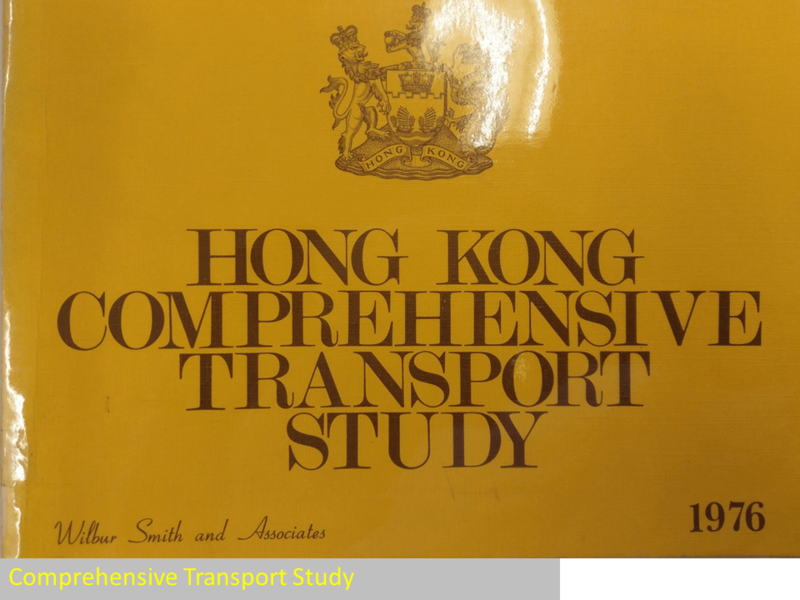 With the publication of the Comprehensive Transport Strategy and the completion of the initial phase of double tracking from Hung Hom to Sha Tin on programme, approval was sought in 1976 to extend the double tracking to Tai Po Market and eventually to Lo Wu. 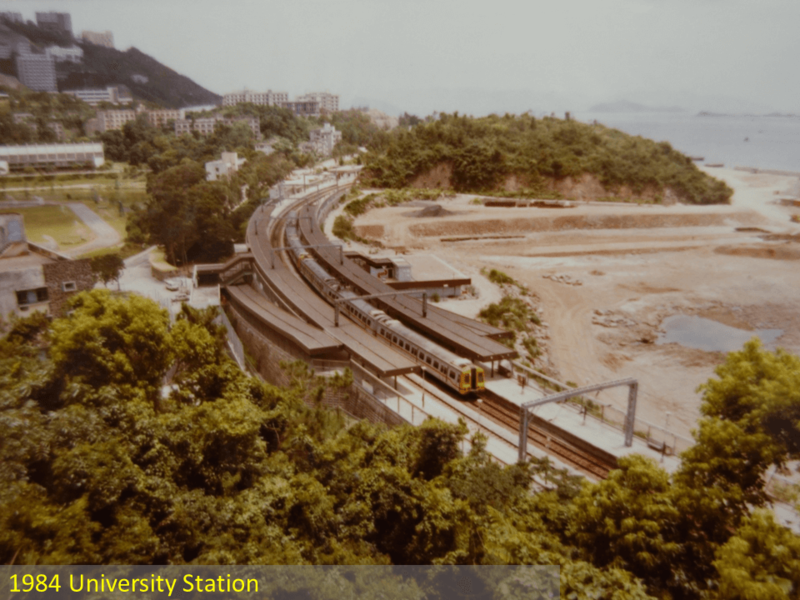 The double tracking works to Tai Po commenced in March 1978 and approval was also given to extend the works to Lo Wu, all for completion in 1980. In addition to the new lines, an extensive track improvement programme was implemented to improve track standards. The ballast depth was increased, timber sleepers were replaced with pre-stressed concrete units, and the rails were upgraded to a UIC54 section. An ultrasonic rail flaw detector was purchased to identify rail cracks that were not visible to the eye and which could result in a rail break and possible train derailment. A duplicate route from Kowloon to Sha Tin. The study commenced in January, 1977 and was completed by September, 1977 with a full report submitted to Government before the end of 1977. 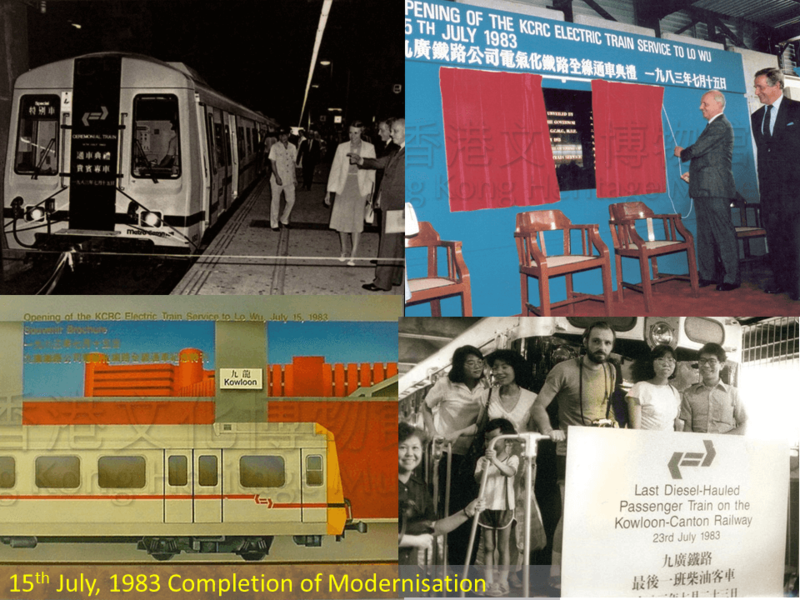 In mid-1978 Government approved the report findings that were; “tantamount to the complete rebuilding of the Railway in situ incorporating electrification at 25kV.” The works included, an expanded maintenance depot at Ho Tung Lau, new signalling and telecommunications systems, three additional stations including an interchange station with the new MTR at Kowloon Tong. Rebuilding the stations with developments above. Electric multiple unit (EMU) trains, configured as a 3-car set that could be joined together to form a 12-car train as patronage grew. 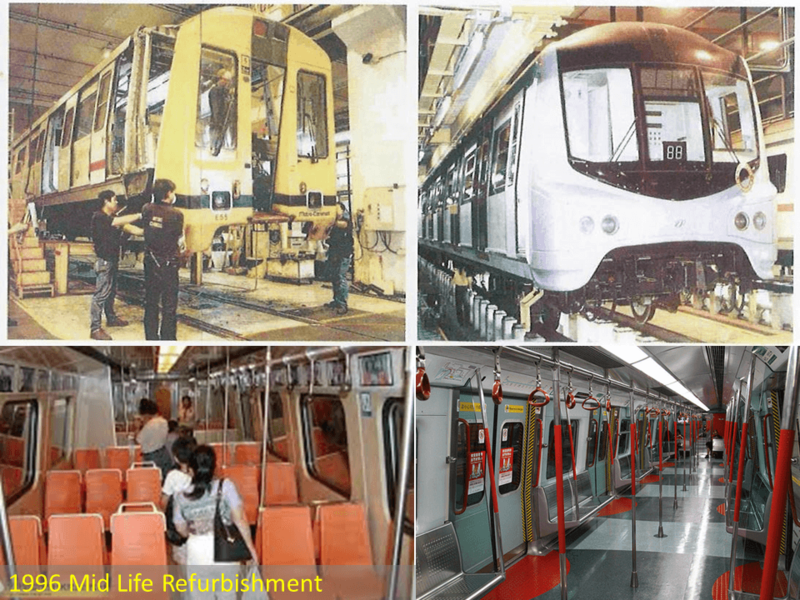 In January, 1979 the Hong Kong Government signed an agreement with Transmark for the project management, design and specialist advice on the modernisation of the line. 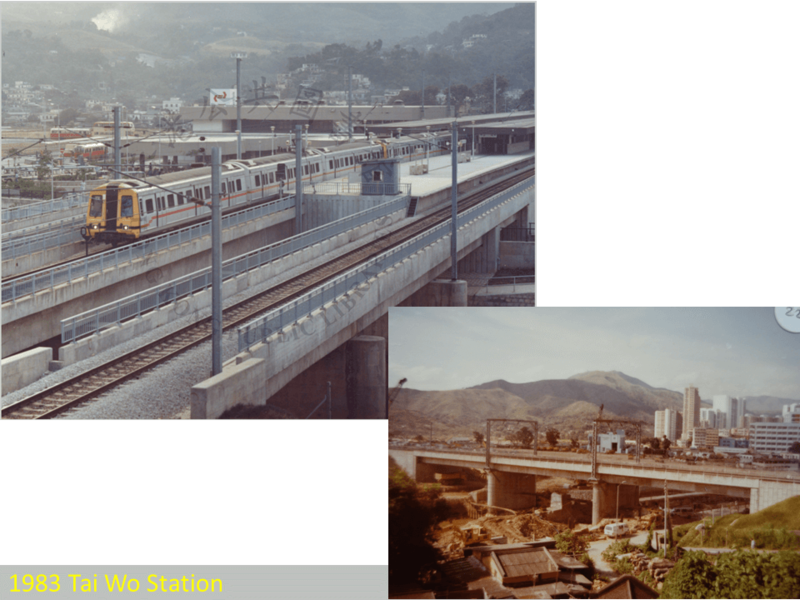 The first stage of the new electric services was to be commissioned in the spring of 1982 between Hung Hom and Fo Tan, with the remainder of the railway to Lo Wu by the end of 1982. 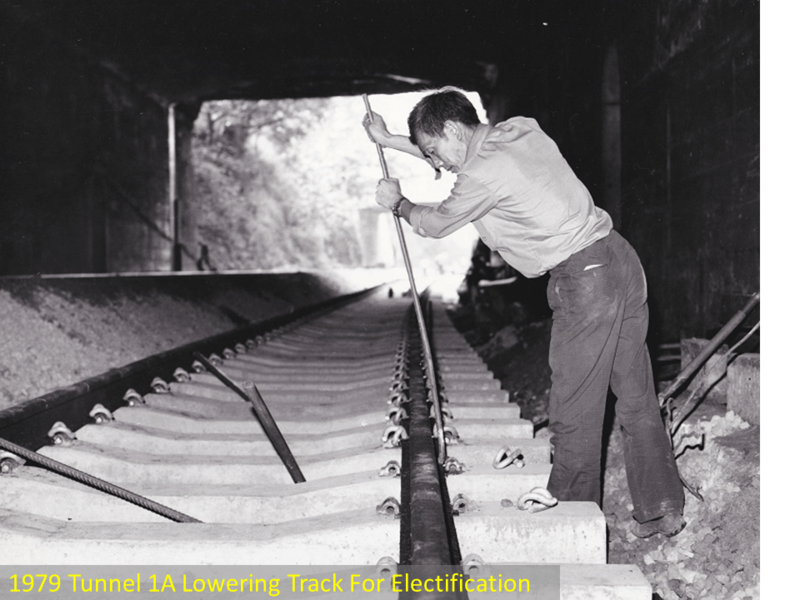 With the adoption of overhead line traction power, it was necessary to increase the headroom clearance, or in the existing tunnels, lower the track. On the 10th July, 1981 the first section of overhead line was energised from north of Beacon Hill to Race Course Station, allowing train trials to commence in late August, 1981 on the six kilometre route. 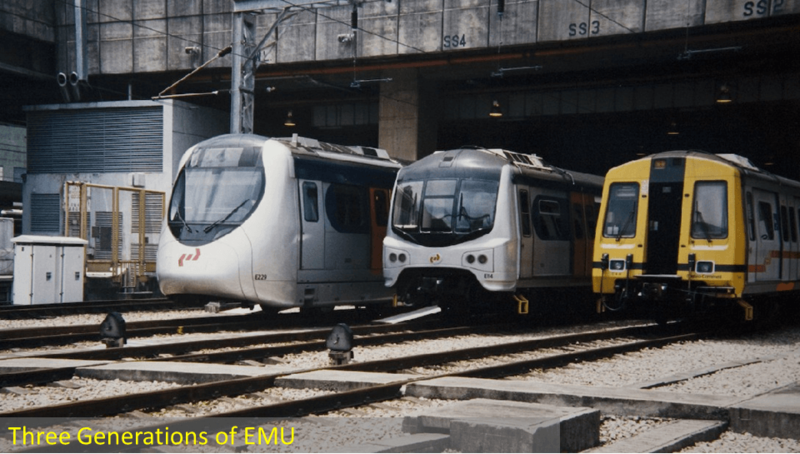 With the completion of the initial phase of electrification between Hung Hom and Sha Tin, the new EMU service commenced on 6th May, 1982. 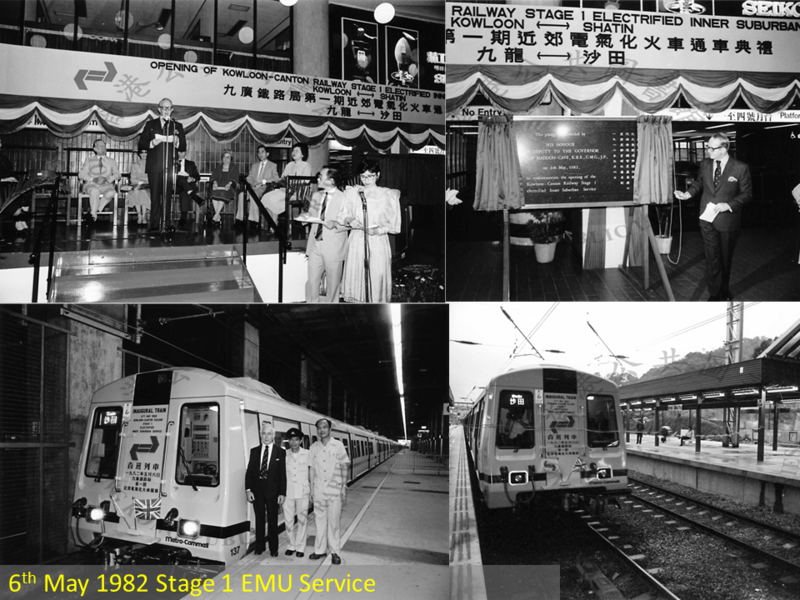 On the 15th July, 1983 the Governor Sir Edward Youde performed the official opening ceremony to mark the completion of the HK$3,500 million modernisation programme of the full 34 kilometre route and the end of the 21 year diesel passenger train operation. The upgrading of the line was more than just doubling the tracks, the railway was to be rebuilt as a modern high intensity commuter railway. This required the line to be fully grade separated from the existing infrastructure. The level crossings had to be replaced with bridges, fencing had to be provided and the stations re-constructed with high level platforms and infrastructure to allow passenger boarding and alighting within the 40 second station stop. a new maintenance depot at Ho Tung Lau. The original Kowloon terminus station was not only under sized for the growing passenger and freight demand, but it also occupied a prime site within Tsim Sha Tsui. Thus, it was relocated to Hung Hom and when the station was eventually finished, an opening ceremony was performed on the 24th November, 1975 by the acting Governor, Sir Denys Roberts, although passenger services did not start using it until 6 days later on the 30th. In March 1995, the KCRC commenced $1.3Bn redevelopment of Hung Hom station to expand the capacity and services of the station. The original Mong Kong station included a freight yard to the north of it for receiving deliveries of livestock from the Mainland. 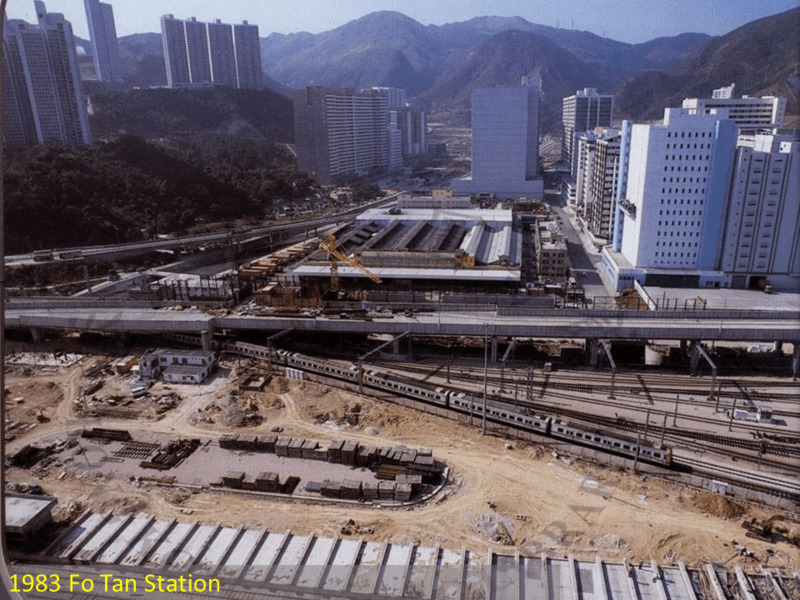 When the decision was made in 1976 to double track the line, it included the reconstruction of the Mong Kok station and provided for a podium for commercial development above. Thus, in September, 1977 the freight siding was closed and the livestock yard moved to the recently opened (October 1976) Ho Man Tin sidings. Work started on the new station in October, 1977 along with the double tracking works. The new station opening in 1982 and the small freight siding constructed to the west of the station was to follow on, opening on the 23rd October 1986 providing spaces for 45 freight wagons. 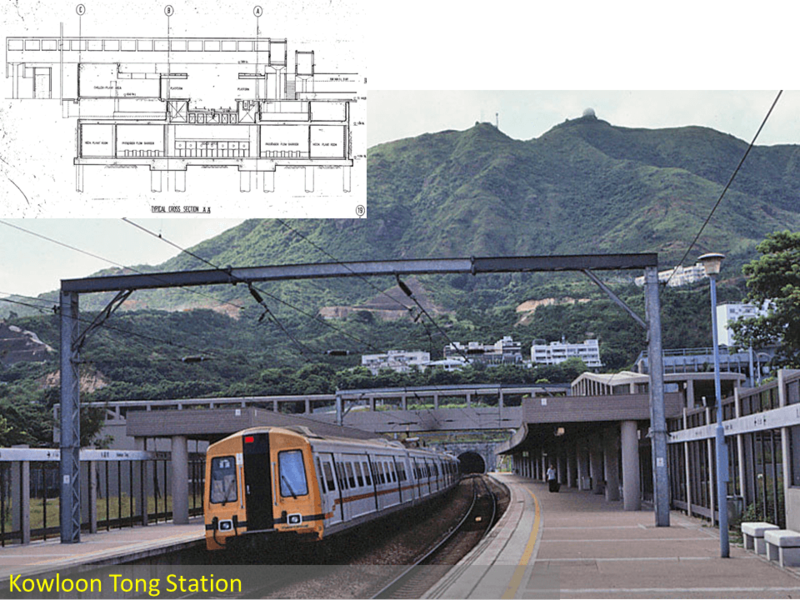 Construction of Kowloon Tong station started in 1980, and was one of the most complicated to build due to the interchange with the new MTR station. The new station had to have three interchange levels with two tracks for each railway. The station was designed to accommodate rush hour trains at 2.5 to 3 minute intervals resulting in a peak hour of 16,000 people boarding and alighting from the trains, equating to about ten per cent of the daily total patronage for the station. A temporary station was constructed at Tai Wai opening in August 1982. The permanent station was not ready for opening until May 1986, and was later substantially enlarged as part of the Ma On Shan Line, opening in December, 2004. The development of Sha Tin was one of the main reasons for the modernisation of the railway. 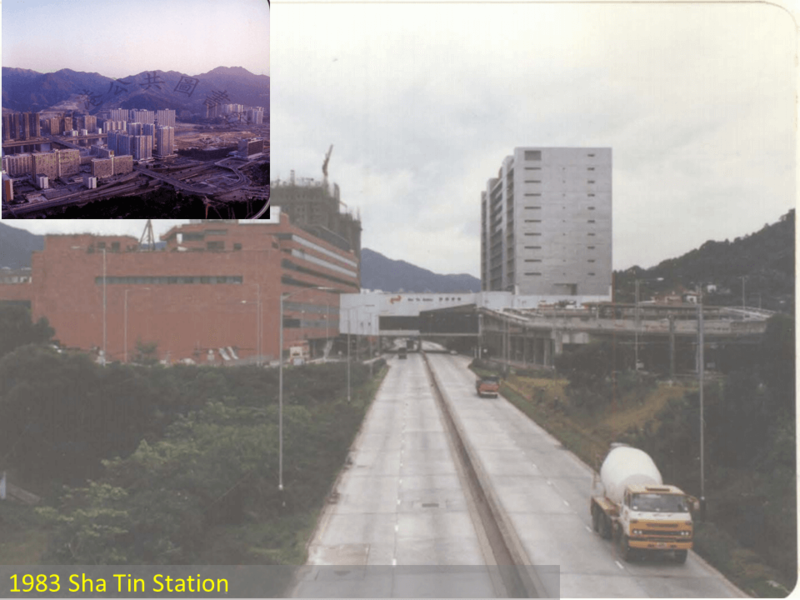 The new town was planned to house over half a million people by the end of 1980s, and to meet the transportation needs, the existing Sha Tin station was rebuilt, as was University station to the north, and with a new station at Fo Tan placed between the two of them. 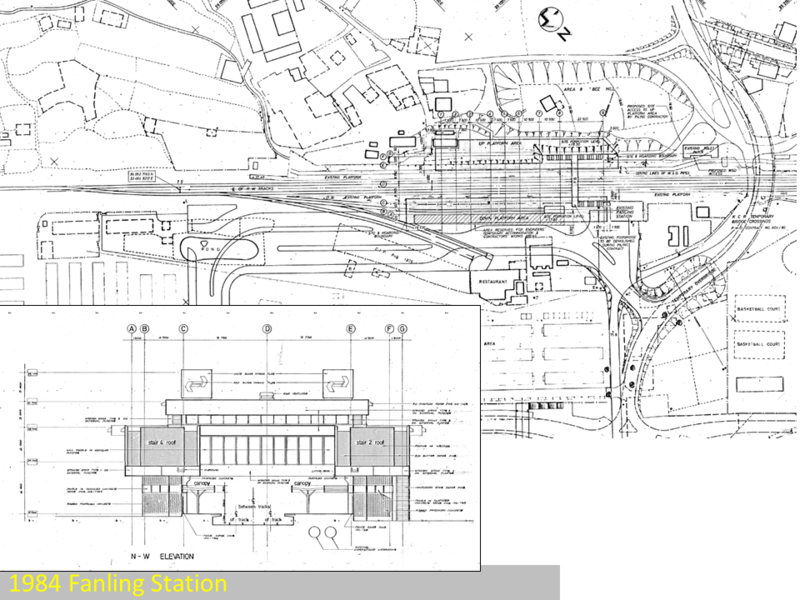 The new Sha Tin station included a podium for development above and was integrated into the new shopping centre. The new Fo Tan Station was linked to the new depot and commercial development above. The station opened in 15th February, 1985 initially serving the industrial estate to the west. The race course track and station was completed in advance of the double tracking works, opening in August, 1978. The existing University station was upgraded with a new structure, completed in time for the commencement of the new services in 1982. The station at Tau Po Kau was replaced with the new Tai Po Market station, serving the growing town of Tai Po. The station was not part of the line upgrade and was closed with the commissioning of the new electric services in May, 1983. Similarly, the spur line and Wo Hop Shek station were closed during the double tracking works. 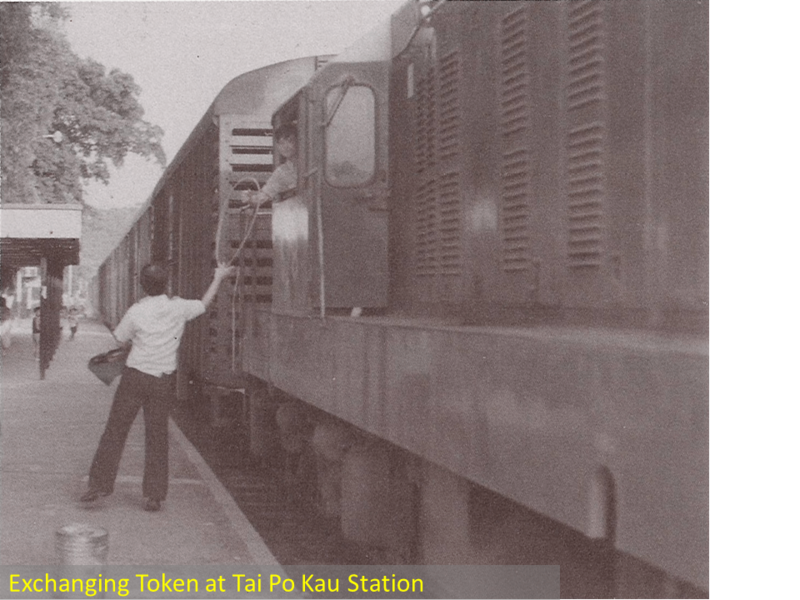 The original station was located within the established Tai Po village, serving the busy market town. With the development of the new town, the station was moved 800m south and the new station of Tai Wo was introduced to the north. The station was built on reclaimed land from the Tai Po River inlet and was linked to a new bus interchange. The new station opened on the 7th April, 1983 and the old station closed to become the Hong Kong Railway Museum. Tai Wo station was a new station on the line, serving the growing population to the north of Tai Po. The station opened on the 9th May, 1989. 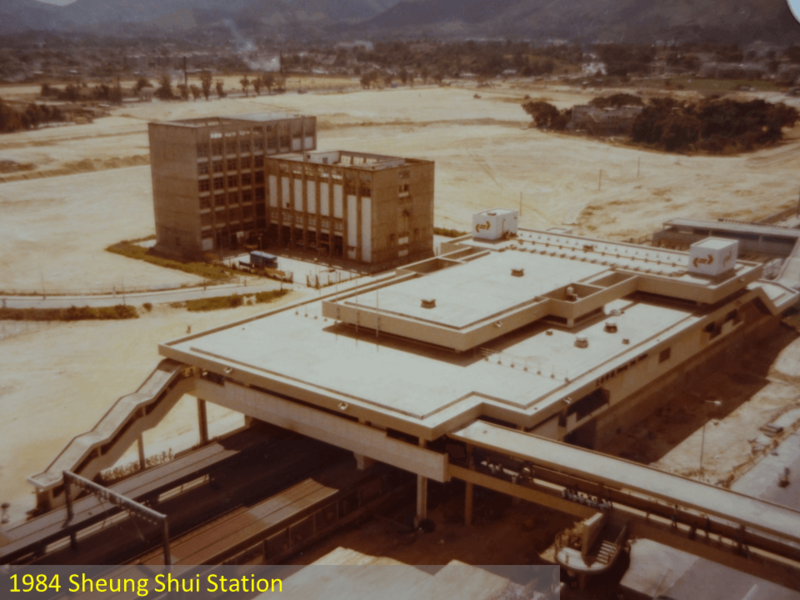 The new station was built on the site of the existing station, serving the new town of Fanling and opening in 1982. The new Sheung Shui station was built to the south of the original station, more central to the planned new town that had yet to be constructed. It opened in 1982. A new four storey station was constructed at Lo Wu, two levels each for outgoing and incoming international passengers. After processing on the upper floors, the passengers descend to the platform where they met up with their mechanically-conveyed luggage placed on an airport-type carousel. The new station was designed to process 12,000 people an hour and opened on the 6th January, 1987. To the south of the station a new freight yard with 3,140m of tracks had been constructed and partially opened in November, 1977 with full opening in 1978. This yard would be used to inspect and marshall goods trains from the Mainland, a service previously undertaken in China. As a cost saving measure, the five original rail tunnels were constructed for single tracks. Following the decision to double track the whole line, studies were undertaken on the best approach for each of the tunnels. Tunnels 1, 3 and 4 were to be opened out, by cutting back the hillside they passed below. Details of the arrangement for Tunnel 1, north of Mong Kong Station are shown below. Tunnel 5, south of Tai Po at 331m long, was to be maintained and a second tunnel was to be constructed adjacent to it. This tunnel was to be circular in shape and lined with reinforced concrete. For the 2,390m long Beacon Hill tunnel, three options were studied, widening the tunnel, build a second tunnel for the new track, or build a new double track tunnel. The first two options were discounted as there was concern about the integrity of the tunnel as a result of the war damage it suffered and the subsequent repairs. 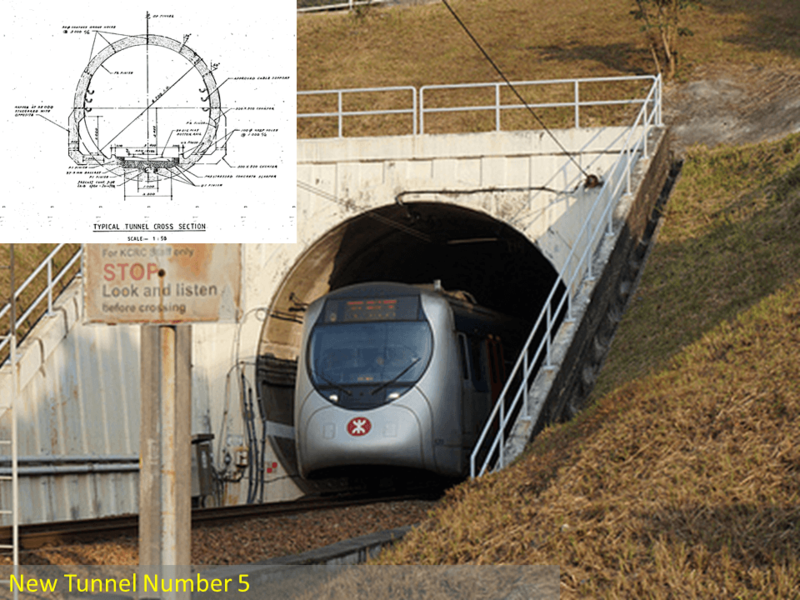 Furthermore, there were major technical problems trying to maintain rail traffic while the existing tunnel was re-built and it was considered that the size and alignment of the original tunnel was not appropriate for modern rolling stock. Thus, the decision was made to build a new tunnel 30-40m to the west of the old tunnel. The design of the new Beacon Hill tunnel followed the British practice of twin tracks within a single tunnel bore and side refuge at 50m intervals stagged on either side. Construction of the new tunnel was awarded to Aoki Construction Company Ltd in January 1978 for HK$94 million for completion in April, 1981. Construction was undertaken from both north and south portals, but as with the original tunnel, difficult ground conditions comprising decomposed granite and faulting were encountered at the start of the drive requiring the contractor to adopt a “Silot Method”. Two side excavations were driven, 3m wide by 4m high supported with steel arches to allow the construction of a reinforced concrete slab and wall. Following behind the main face, at 7m high by 10m wide was excavated using the concrete side wall to support the steel ribs and jacked steel lagging using the “Messer Methods”. As the ground improved the need for laggings was dropped and rock bolts were adopted. The alignment of the tunnel was developed to provide natural drainage to the portals. From the south, a rising gradent of 1:330 was adopted, and of 1:500 from the north. The latter had to ensure that the tunnel would pass over the top of an existing DSD water tunnel with a minimum of 1m clearance. The DSD tunnel was originally unlined but had to be reinforced with welded steel plates and protected with epoxy finish 40m either side of the proposed railway tunnel crossing to ensure its integrity. 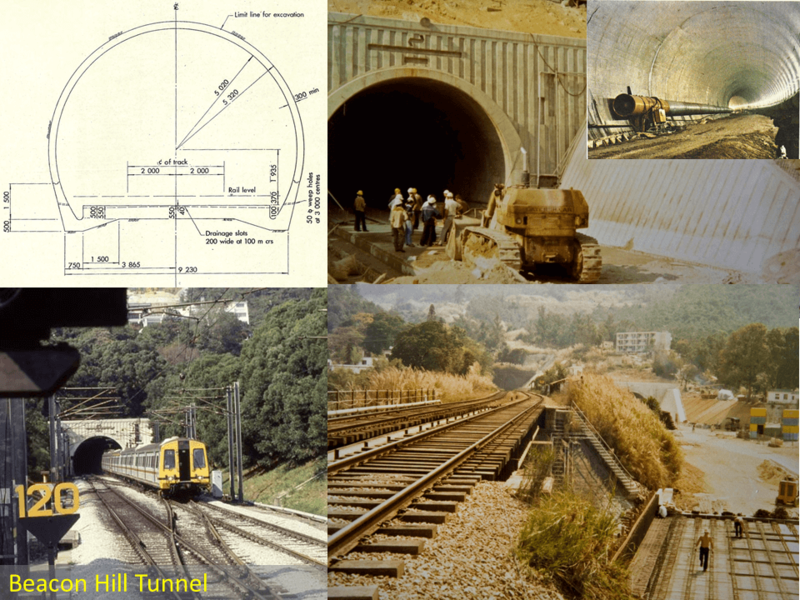 The tunnel broke through on 23rd April, 1980 and the lining and concrete trackslab was completed in early 1981. 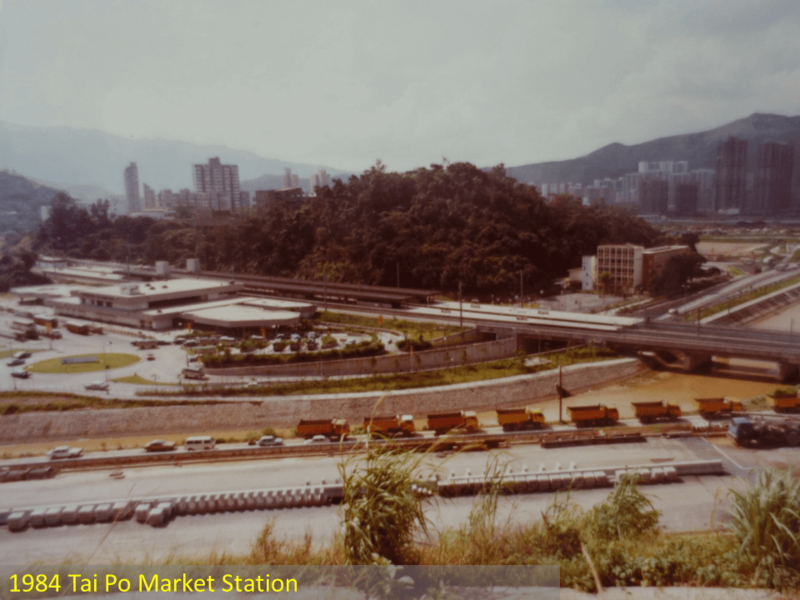 With track installation and completion of the new bridge at Tai Wai, the new HK$120 million tunnel commenced operation in April, 1981. 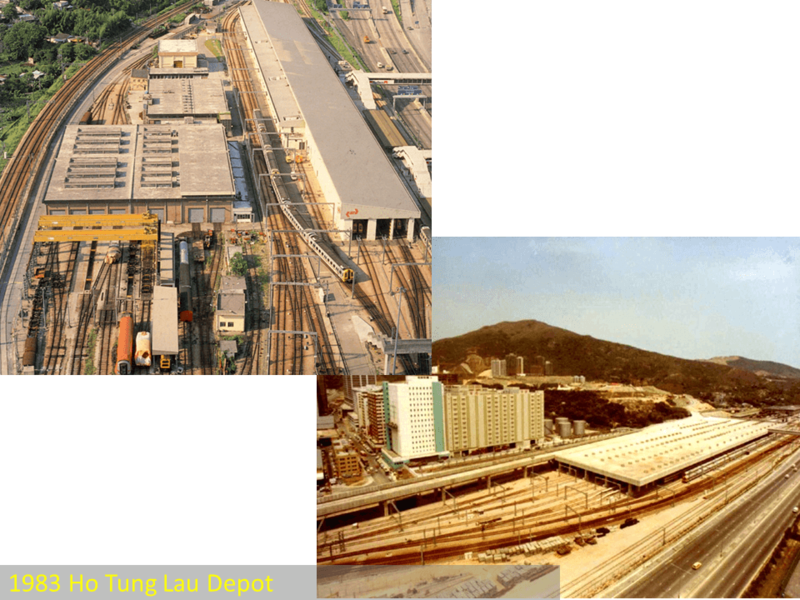 The depot at Ho Tung Lau was commissioned in 1968, allowing the original depot at Ho Man Tin to be de-commissioned and the land used for highway infrastructure. As part of the modernisation a staged re-development of the site commenced. The initial stage provided a new shed for the new rolling stock, opening in 1981 and included a podium to the south for future property development. The works were staged to allow the existing depot facility to maintain operations of the existing fleet and commissioning of the new EMU trains. In the late 1980s, the depot was upgraded to provide a full range of maintainence facilities for the expanding fleet. 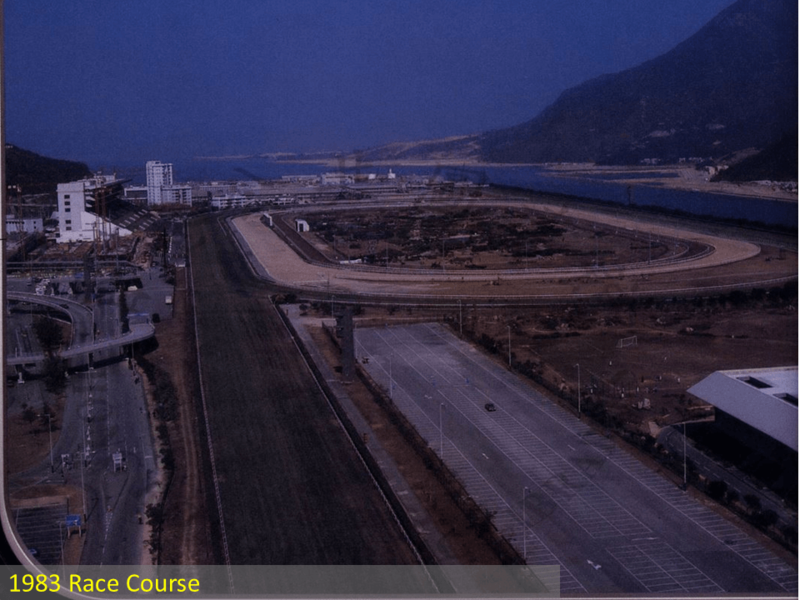 Commenced in April 1989 for an estimated HK$500 million, new maintenance buildings and workshops were constructed along with stabling facilities and a covered podium. The facility was completed in November 1993. Development of the topside of the site commenced with the KCRC headquarters building and the Royal Ascot residential development, completed in two phases in 1995 and 1997. The final development stage was for The Palazzo residential development, completed in 2009. To the north of University station, the track alignment followed the original 1910 route around the former Pak Shek Kok bay. 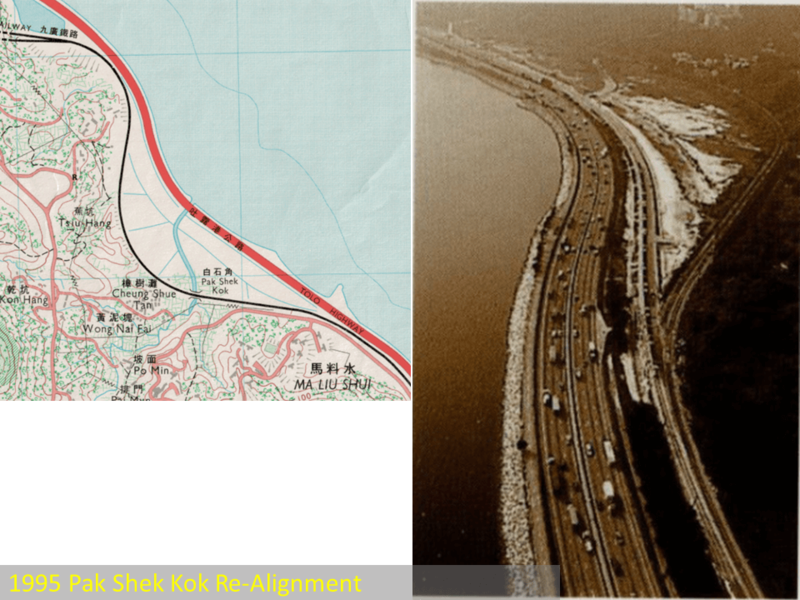 With the earlier reclamation and completion of the Tolo Highway, a 2km section of the railway containing the sharpest curve on the line was straightened to improve performance, with an overnight change over to the new alignment on the 8th Oct 1995. The original line operated as a single track with passing track loops along with double tracks between Hung Hom and the Kowloon Terminus. 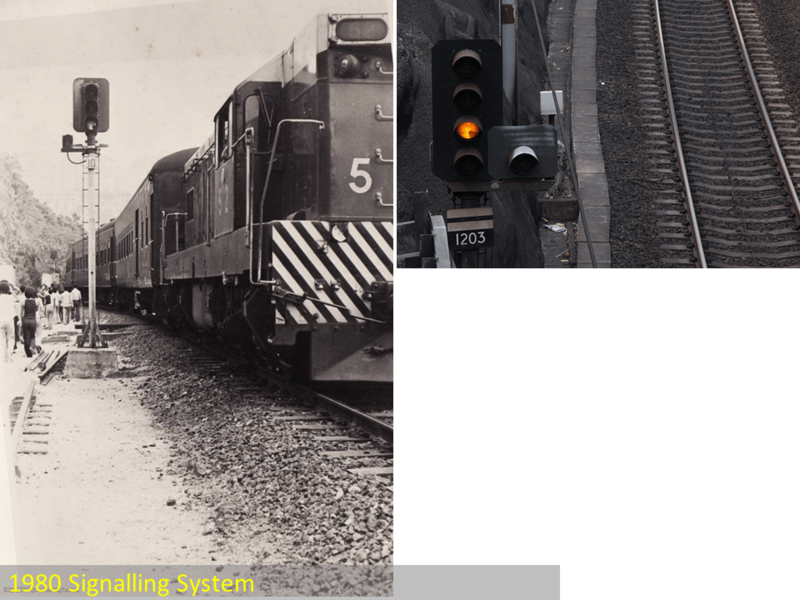 A signalling system was implemented to prevent trains running into each other on the single track, thus the line was divided into a series of ‘blocks’ allowing only one train in each block using a semaphore signal to indicate the status of the block. Thus, when a train passed into a block, a signalman would protect that block by setting its signal to ‘danger’. When an ‘all clear’ message was received, the signalman would move the signal into the ‘clear’ position. After the Second World War, a “double wire” signalling system was implemented for the stations south of Fanling. 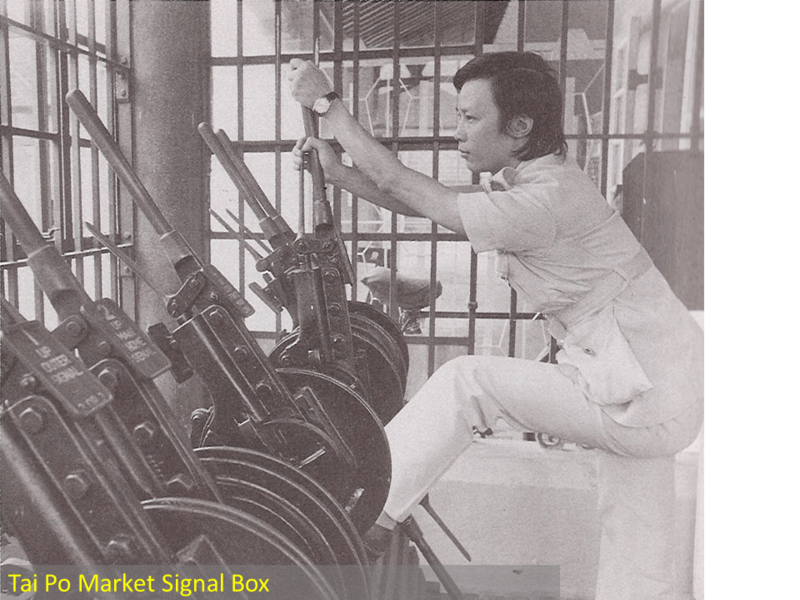 This allowed the signals to be set from the station buildings/signal boxes and in 1951 a new 25-lever signal box with mechanical signalling was commissioned at Hung Hom to control traffic between Kowloon and Yau Ma Tei. 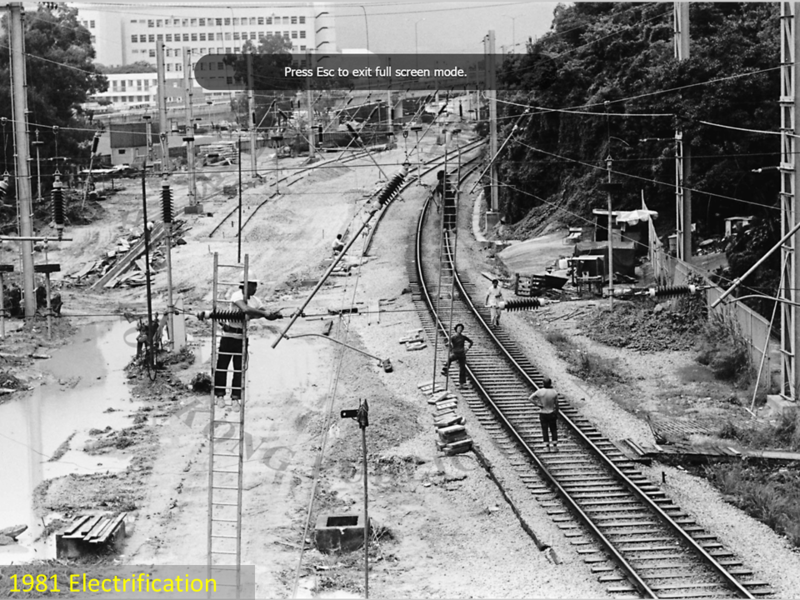 In 1961, installation of new electrical systems was implemented at the Kowloon Terminus, to replace the mechanical wire controlled system. Commissioned on the 28th November, 1963 the new arrangement used power operated light signals to inform drivers of the line status and electric motors to set the points. The token arrangement supported a 30 minute train headway, sufficient for the less than 40,000 passengers a day. However, with the upgrading of the line to double tracks, a new signalling system would be required. Transmark designed and specified a coloured light signalling system. This allowed trains to operate at 4-minute headways south of Sha Tin, and 15-minute headways north of it to Lo Wu. The signalling system was based on British Railway designs and specifications, with the components being supplied by Westinghouse Brake and Signal Company Ltd. The southern section used a 4-Aspect coloured light signalling system and the northern section a 3-Aspect arrangement. Installation of the system commenced in February 1978 for commissioning in 1980. The new scheme used signalling relay interlocking rooms distributed along the line with remote control links back to the Control Room at Hung Hom. The new Control Room managed the entire main line to Low Wu. 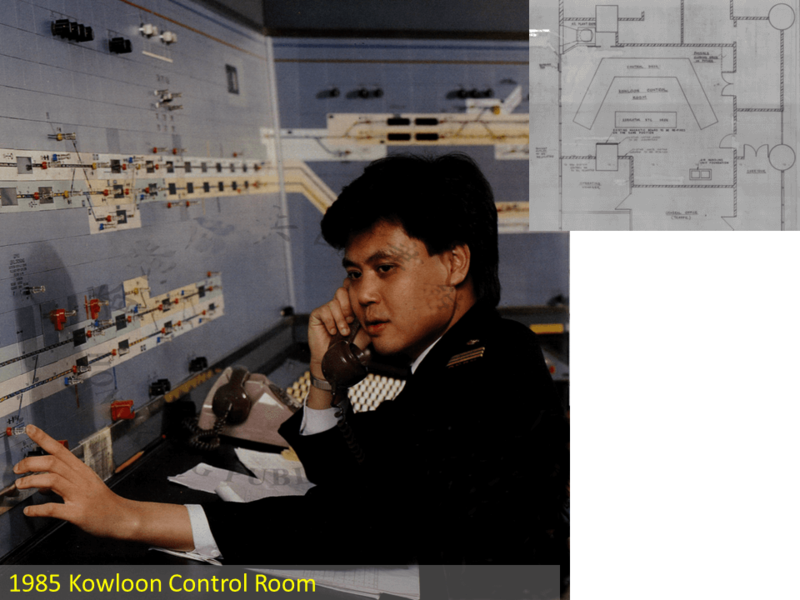 Hung Hom had the signalling control and 25kV electrification control co-located in the same room as the traffic controller. This was a new approach, and an early example of integrated rail control on a mixed traffic heavy rail system. This new system allowed the 16 trains and two cross boundary trains operating in 1972, to increase to 181 trains and two cross boundary trains a day in 1983. This allowed the railway to increase the service as passenger demand grew from 19,000 a day in 1978 to 190,500 a day in 1983, and to 372,000 in 1987. With the continuing growth in passenger transport needs, it was clear by the late 1980s that improvements would be required to the signalling system. Two significant events in the UK influenced the strategy for the new system. Following the King’s Cross fire in 1987 and the 1988 Clapham Junction collision, the Fennel Report on the King’s Cross incident recommended rigorous safety management from the top management level downwards. The Hidden Report on the Clapham Junction incident recommended the introduction of automatic train protection (ATP) to prevent drivers from ignoring red lights. The KCRC recognised the importance of these issues and took them on board in the design of the re-signalling project. By 1994, the approach for the new signalling system was fixed and the contract awarded to Alstom to introduce ATP to the line using their TBL signalling system. The approach was to overlay the existing 4-Aspect colour signalling system with an ATP system. This was necessary as although KCRC could upgrade the new EMU rolling stock for the system, the presence of Mainland operated intercity trains could not accommodate the new requirements. The design of the ATP allowed each EMU train to identify itself as an ATP train, leading to the system to operate in ATP mode with in-cab signalling. Along with trackside components including; points, signals, track circuits, axel counters, beacons, stop loops and return loops allowed shorter headways to be adopted, increasing line capacity to 24 trains per hour. The system was commissioned in August 1998. 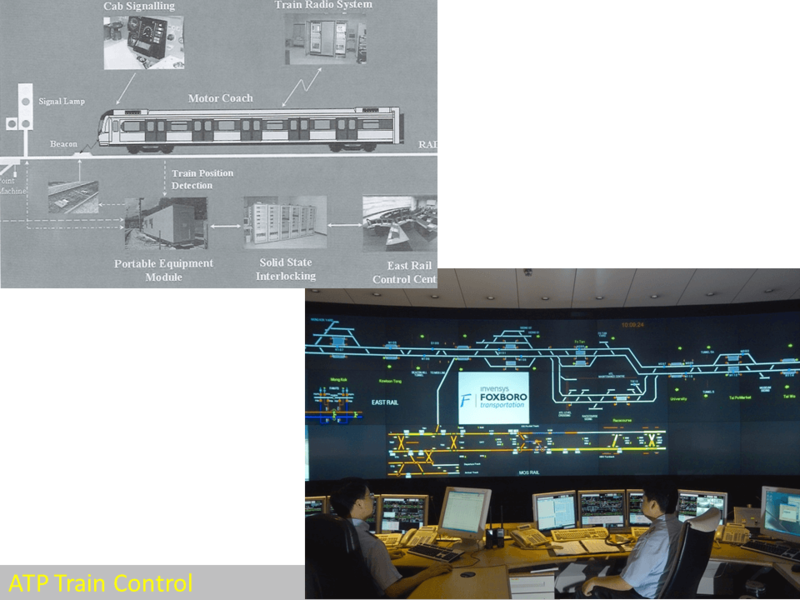 With the new signalling system came the new Integrated Control Room in KCRC House that opened on 27 April, 1995, replacing the Hung Hom control room. With continued increase in passenger demand and an expanding railway network, a KCRC internal study identified a number of limitations including human reaction times to changing signals and lack of train stopping accuracy, both inherent in manually driven trains. In December 2002, the KCRC commissioned an upgrade to the signalling system to introduce automatic train operation (ATO), allowing ATO equipped trains to be driven automatically and which boosted the train headway to 27 trains per hour. 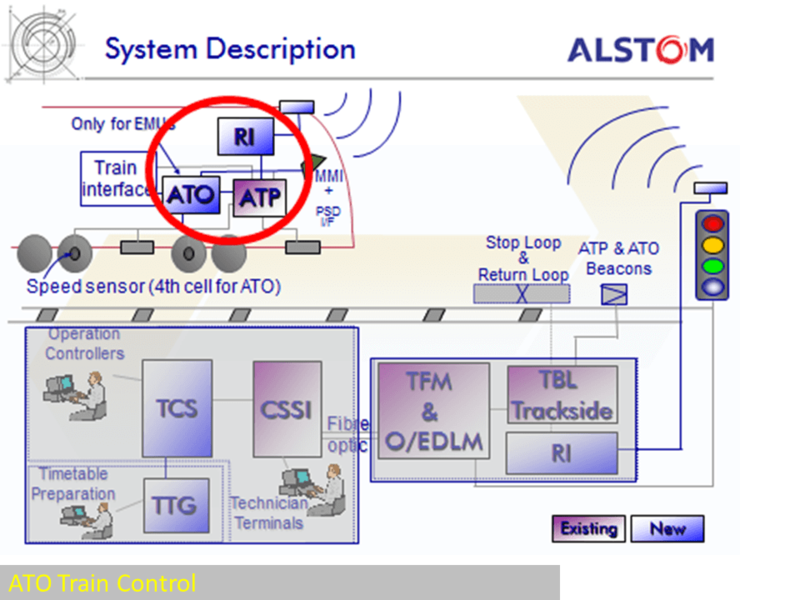 The ATO system took control of the traction and brake commands from the train driver, observing speed targets with the maximum line speed provided by the ATP. The train driver, monitored the system and controlled the closing of the train doors and initiating the ATO. Following the Second World War, the line initially operated steam hauled passenger coaches, and during the 1950s, the steam trains were replaced with diesel electric locomotives with the last steam train being withdrawn from service on the 2nd September, 1962. With the growth in traffic during the 1970s, new coaches were required to address the chronic overcrowding and to replace the ageing pre-war vehicles. In 1972, following an international tendering process, 40 new coaches were ordered from Kinki Sharyo of Japan and put into service on the 4th November, 1974. The order consisted of 11 first class and 29 ordinary class cars. With the arrival of the new coaches, 11 of the pre-war coaches were scrapped and 14 refurbished as special trains, and three retained for the railway engineering department. With the decision to adopt new rolling stock, in August 1978 an international tender was issued for the supply of 45 three-car EMU trains or 135 cars. The contract was signed with Metro Cammell in early 1979 for delivery in early 1981. The order was extended to 60 sets, an additional 45 cars giving a fleet of 180 cars at cost of HK$500 million. 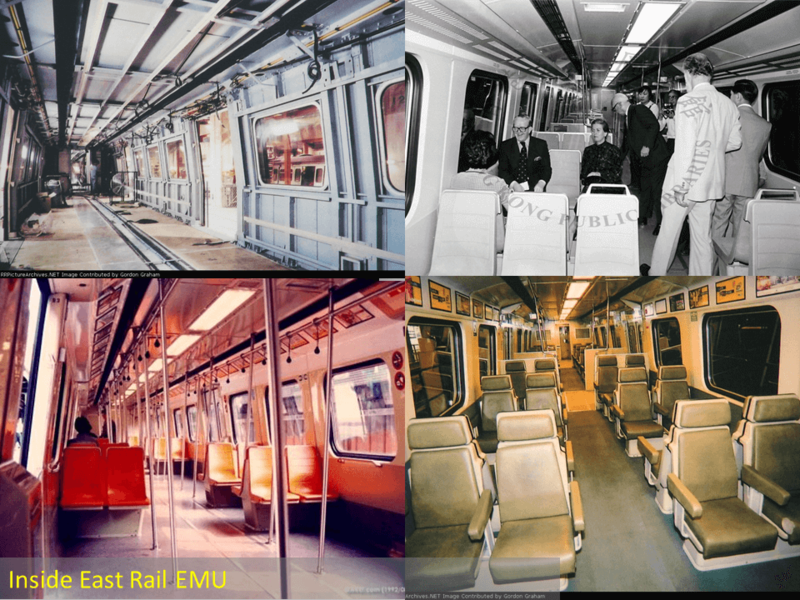 Passenger numbers continued to grow and a further 25 sets of three-car EMU trains were ordered from Metro Cammell in 1985 for delivery in July, 1988, and the first 54 were put into service in December, 1989. 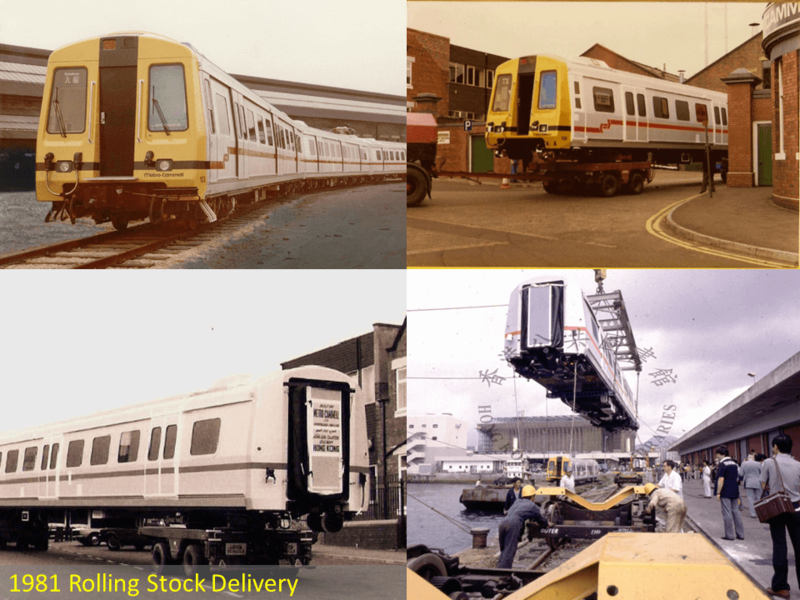 In 1989 a further 32 sets (96 cars) were ordered from Metro Cammell, which entered in to service in early 1992. The first cars arrived in December, 1990 with the remainder during 1991, bringing the fleet to 351 cars. The initial trains were operated as three-car trains, extended to two three car sets to a six car train. As demand grew, the train lengths increased until 1991 when all trains operated as a 12 car set. By 1991, the Corporation was operating 29 trains in a 12-car configuration (348 cars) and by 1994 operating a minimum headway of 2.5 minutes. However, overcrowding was still a problem during peak hours. To improve the situation it would be necessary to improve boarding and alighting times and to increase the internal capacity of the cars along with the improvements in signalling capacity. By 1996, over 50% of the fleet was reaching its mid-life after 15 years of heavy service. Thus, it was decided to undertake a mid-life refurbishment programme to increase capacity and take advantages of changing technology to improve performance, reduce costs and improve safety of the vehicles. 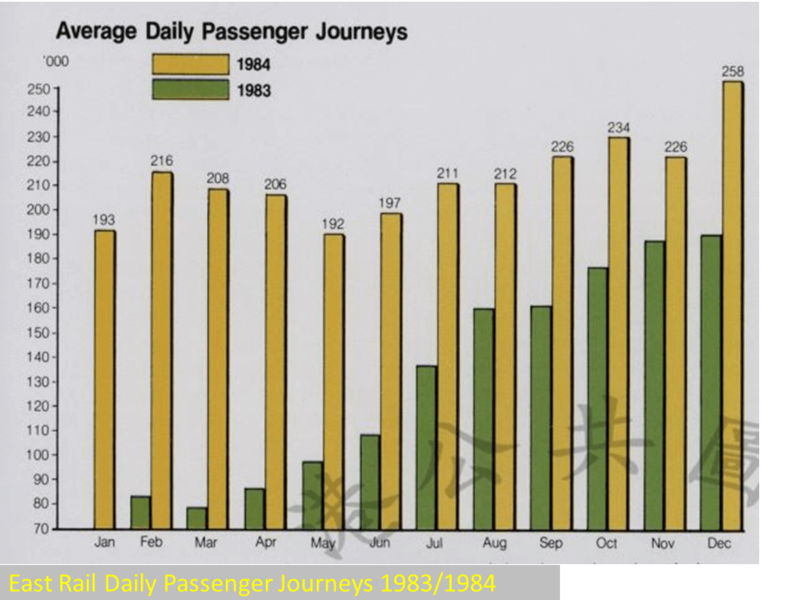 Train capacity was increased 15% by changing the internal seating arrangement from transverse to longitudinally aligned seating, removal of luggage facilities, removal of the redundant three-car driving cabs and opening up the connecting car gangways. To improve boarding, the three side doors on each side of a car were increased to five, and the train cab and front re-modelled to accommodate the new signalling equipment. Following an accident in 1984, two cars were scrapped and the single remaining car was not upgraded and remains in its original form stored in the Ho Tung Lau depot. 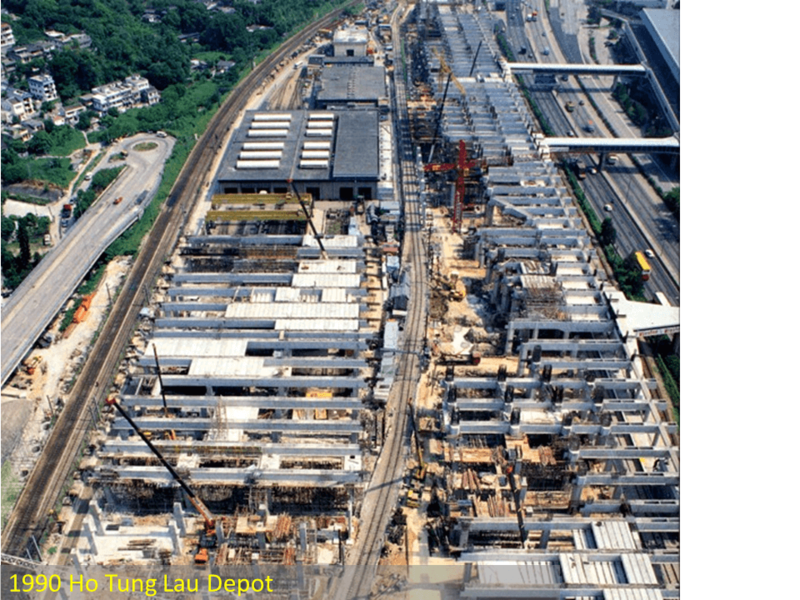 In 2003, 8 sets of new trains were supplied under the West Rail Contract SP1900, and the 96 cars were supplied by Japan-based Kinki Sharyo Co., Ltd.
At 15:00 on 18th December 1980, a contractor building the new Mong Kok (now Mong Kok East) Station accidentally severed some signalling cables, disabling the automatic signalling system. At the time, the railway had been only partly doubled-tracked, and still made use of the old single-track Beacon Hill Tunnel. Later in the day, two trains were inadvertently put on a head-on collision course just south of the tunnel. At 18:40, a Lo Wu-bound train carrying about 1,500 passengers reached the point where the double-tracked section of the railway ended ahead of the tunnel, near Yau Yat Chuen. A safety device, a trap point, prevented the collision by forcing the north-bound train to derail just ahead of the tunnel, causing minor injuries to some passengers. A minute later, a south-bound train came to a screeching halt at the accident site. A KCR spokesman blamed “a misunderstanding in a telephone communication”. 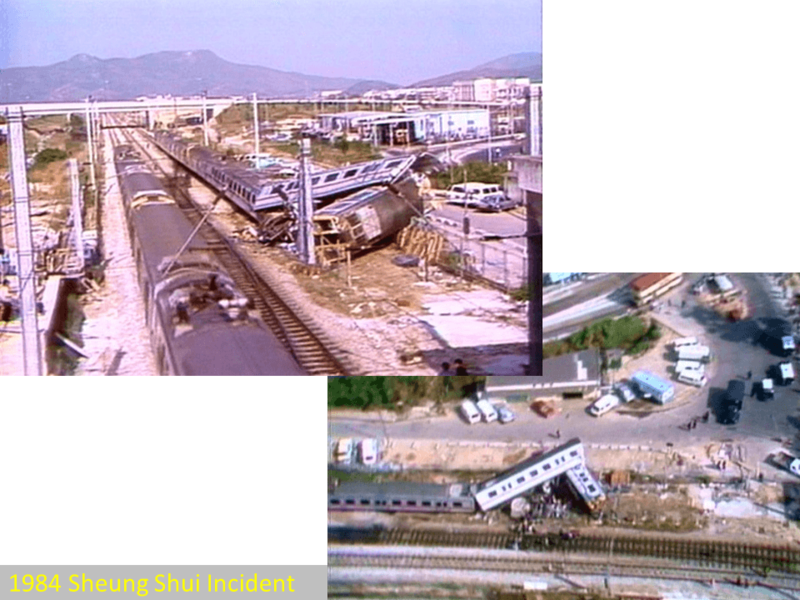 On 25th November 1984, a train derailed just north of the Sheung Shui station. The incident occurred when a train had finished a north-bound service and was turning around to re-enter service at Sheung Shui for a south-bound service. This manoeuvre was achieved using a crossing from the north-bound track to south-bound track, then entering a siding, so the train could wait clear of the main-line ready to re-enter services. With the driver in the rear cab and the train guard in the front cab, the train started to move to the main-line, missing the danger signal as the turn-out had not been set, with a train speed of 30kph there was insufficient track to brake before the end of the track. The train crashed into a concrete buffer at the end of the siding, with the first two cars piling on top of each other. The damage was so severe that the cars never returned to service. The KCR determined that the accident occurred due to human error and not any system failure, suspended the driver, and changed procedures such that drivers were required to operate the train from the front carriage while shunting at Sheung Shui. In 1988, there were numerous separate incidents of Chinese freight trains derailing on the railway, primarily due to the poor quality of rolling stock. On 28 May, 1988, a locomotive and a goods wagon jumped the tracks near Fo Tan Station, blocking the line. Services were temporarily detoured through Racecourse Station. On 4 June,1988 a wagon derailed near University Station, again blocking the line. Coupled with a lorry accident in the Lion Rock Tunnel the same day, Kowloon and Sha Tin were thrown into “traffic chaos”. On 2 July, 1988 another goods wagon derailed on a siding in Lo Wu after arriving from Shenzhen. As it was being hauled to the Fo Tan workshop at 1:44 am the following day for examination, it derailed again, though damage to the tracks was minor. Nobody was injured in the above incidents. The problems were attributed to uneven loading of the freight trains, sharply curved trackage “unideal” for the freight wagons, and the structural characteristics of the Chinese trains. In response, KCRC carried out track improvements and liaised with the Guangzhou Railway Administration. 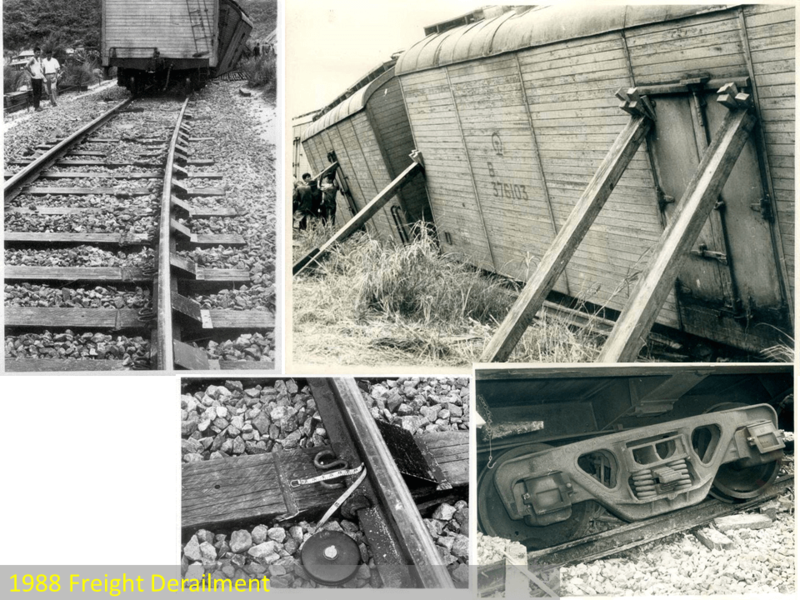 At the time, the KCRC handled 6.25 million freight wagons per year, so the derailments were relatively isolated occurrences. In the early morning of 31 May 1989, diesel locomotive L57 collided head-on with locomotive L56 at Mongkok (now Mong Kok East) Station, causing injuries to four KCR staff. Three employees in L57 were taking the locomotive from Kowloon (now Hung Hom) station to Fo Tan for repairs. The locomotive ran a red signal and struck the stationary L56 while traveling at about 50 kph. Chan Yau-keung, a KCR Corporation construction supervisor, was critically injured and died on 8 June at Kwong Wah Hospital. He had been standing between the driver Ko Yuk-ching and co-driver Lee Kam-ming, both of whom were seated. Ko was a qualified driver while Lee, an assistant operator, was operating under Ko’s supervision. Lee was driving at the time of the accident, but was seated in the left of the cabin and could not see the signals, which were on the right and were obscured by the long hood of the vehicle. According to procedures, Lee had to rely on Ko to relay him the status of the signals. Ko, speaking at an inquest following the accident, stated that he had felt dizzy and could not recall what colours the signals displayed. The advance warning system (AWS) of locomotive L57, which would have automatically halted the train, was switched off. KCR officers in the control centre saw the impending collision but could not warn the crew as the L57 radio was switched off. Throughout the 107 year history of East Rail, the line has been the subject of ongoing development to respond to the changing nature of the demands. With the implementation of the Shatin Central Link project, East Rail is once more being redefined with new rolling stock and a new terminus in Admiralty, taking the line across Victoria Harbour and in to the heart of Hong Kong Island. This article was first posted on 13th September 2017.